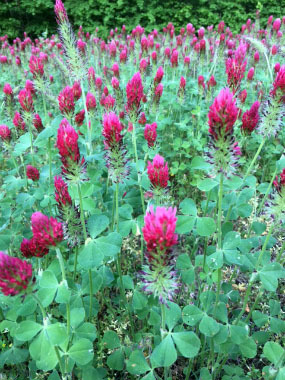 Crimson clover is a species of clover in the family Fabaceae, native to southeastern Europe and southwestern Turkey. It spread to Asia and then to the U.S. by 1819. 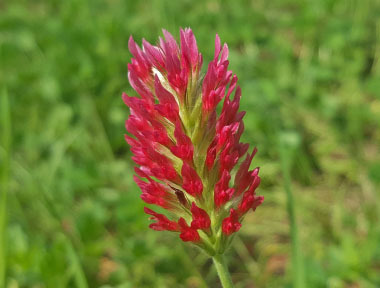 It has a distinctive, brilliant, crimson cone-shaped head of florets. A special thank you to Rita B. Chancy of Tennessee for donating all of these images! 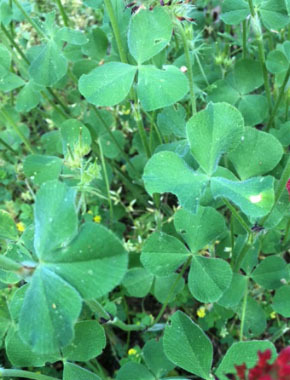 Distinguishing Features: The leaves and stems of crimson clover resemble those of red clover, but the leaves are round-tipped with more hair on the stems and leaves. Seedlings grow rapidly from the crown forming a rosette. In the spring, the flower stems rapidly develop and end their growth with long, pointed conical flower heads. The flowers are a beautiful crimson colour giving it a very distinct and beautiful look. Its taproot can grow to a depth of 55 cm (21”). Flowers: The flower heads are conical and each one is comprised of 75 to 125 florets. Florets are a bright crimson color and open in succession from the bottom to the top each measuring 9 to 15 mm (0.35–0.6 in.) long, fused at the base. Each flower head has 10 stamens. Inflorescence is a long-stalked, dense, racemose head. It flowers from June to August. 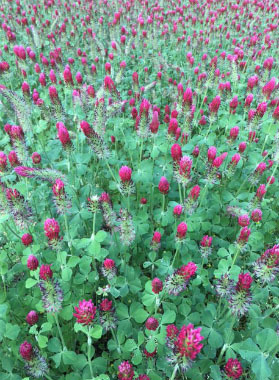 Fields of Nutrition has medicinal benefits and vitamin/mineral content of Crimson Clover. Leaves: Leaves are alternate, stalked, and stipulate. Blade with 3 leaflets; leaflets widely obovate to obcordate, with entire–shallowly toothed margins and they are hairy. Stipules are elliptic, blunt, violet-veined, reddish-tipped, mostly fused with stalk. Height: This plant can grow anywhere between 30 and 50 cm (12 - 20") tall at maturity. The stem is unbranched, hairy and erect. 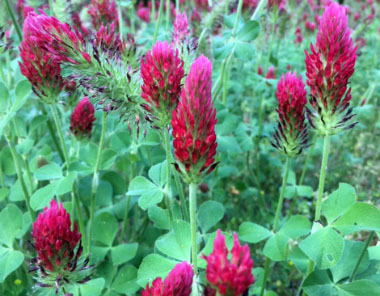 Habitat: Crimson clover grows in meadows, fields, lawns and in cultivated areas. It grows in many countries. Edible parts: The seeds and flowers are edible. Seeds can be sprouted and used in salads or sandwiches. They can also be dried and ground into flour. Flower heads can be used fresh or dried as a tea.